At the end of July, we gathered in California's Tehachapi mountains for the California Nonprofit Technology Leadership Summit. Participants included nonprofit staff, grassroots organizers, students, and many mentors that we've known from our CATechFests over the past five years. 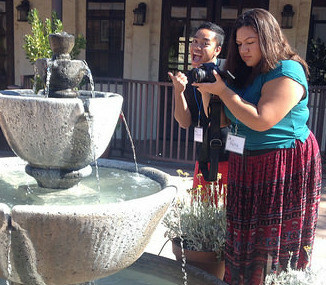 Taking place in the National Cesar Chavez Center, this two-day retreat was designed to strengthen a network of rural and urban leaders through dialogues, workshops, and skillshares. 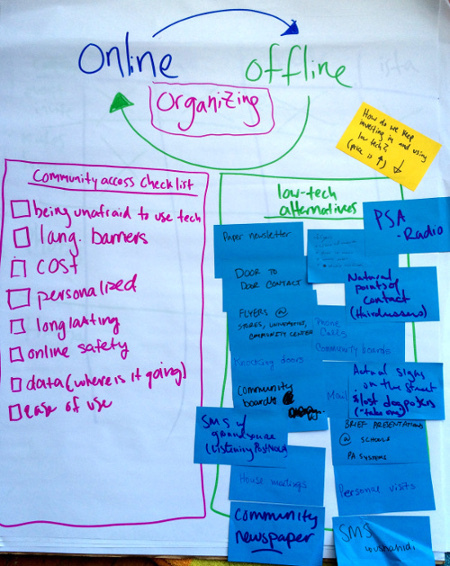 During a communications workshop, participants from Kern County's Dolores Huerta Foundation inventoried and explored low-tech tactics for community organizing in rural California— a perspective that is often overlooked in technology (aka tech-centric) discussions. Early on in the event, A.D. and Angelica from Students Making a Change explored the material layer of technology development (metals, plastics, waste), and how it fits into social justice and technology struggles. 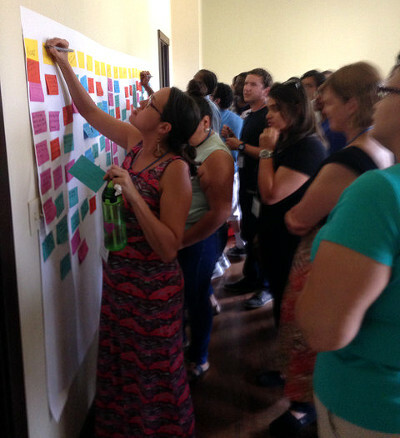 This was the first time environmental justice topics claimed space in our agenda brainstorm. During one-on-one skillshares, Khon from Center for Multicultural Cooperation shared multimedia skills through a hands-on digital SLR camera workshop. These kinds of brief mentoring opportunities helped build practical skills and emphasized the value of direct experience. 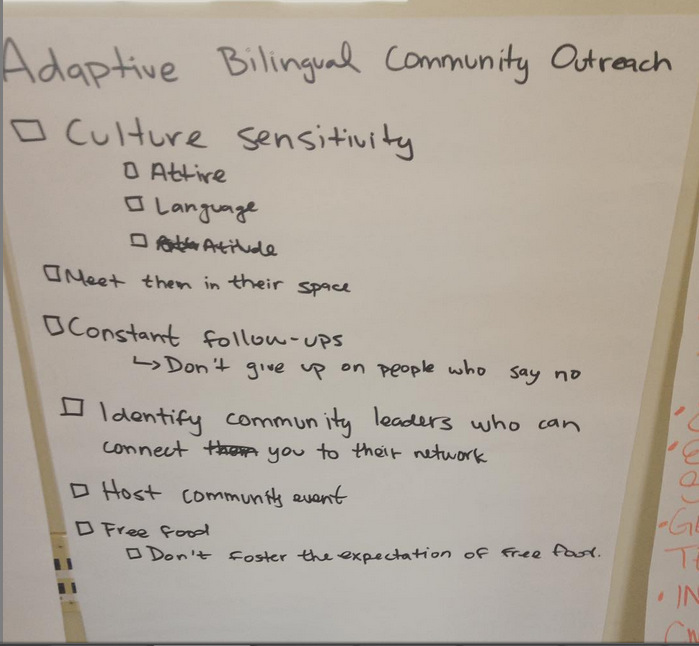 Collaborating with JC, participants cocreated a checklist for Adaptive Bilingual Community Outreach, which continues to be iterated and improved. It was an honor to stay on the land where Cesar Chavez lived and labored during the last few years of his life, and the venue provided many opportunities to get in touch with the history of the space. Thanks to the hospitality of the Cesar Chavez Foundation, participants were given the opportunity to explore the land, take a tour, go on hikes, and visit surrounding landmarks. 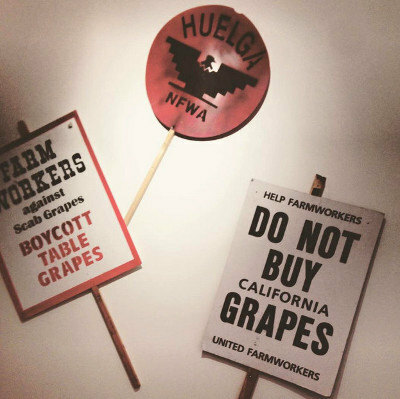 On the second day, Paul Chavez, Cesar's son, graciously joined our lunch hour to share his family's stories of the United Farm Workers movement. We are beyond thankful for everyone that made this event possible. This week, we are meeting with our friends and fellow CA Tech Fest organizers to kick off the next state-wide California Nonprofit Technology Festival. The two days we spent in the mountains inspired us to continue growing, holding space, and supporting nonprofit leaders around the state. We would love for you to join us at the next convening. Sign up to our newsletter or send us an email.